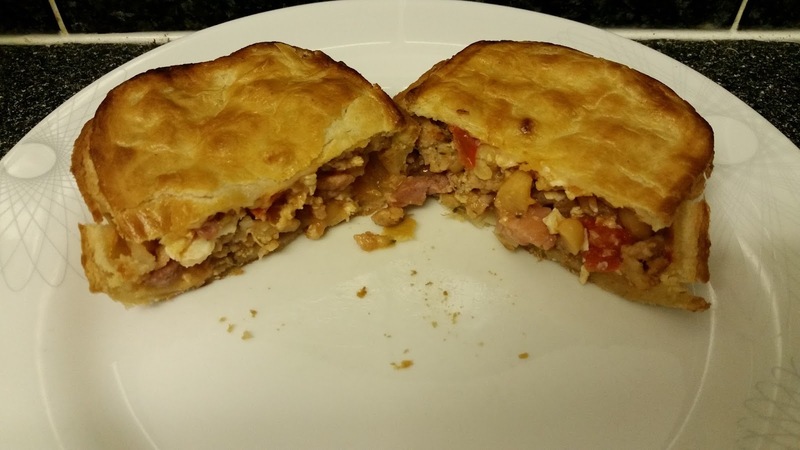 continue reading "A ready meal pie? I'm always ready for pie!" Once again, Pierateers RAS and TJP came knocking at the Punch Tavern on London’s Fleet Street to see if they could deliver some more knock-out pies. It was November 2014 when RAS and TJP first tried the pies at this gin-friendly gastropub - and what great pies they were! 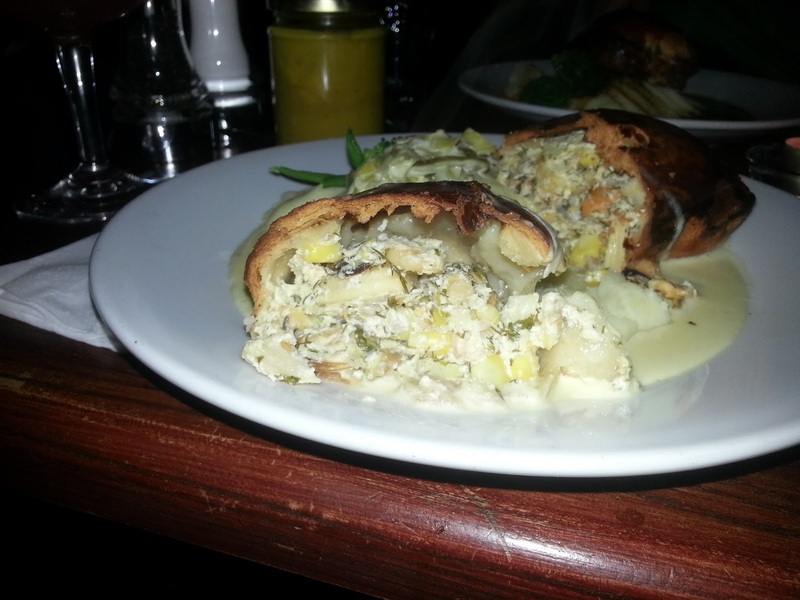 The chicken pie clucked up a Pierate 'Highly Recommended' 6.02/7, while the rabbit pie jumped in at 5.92/7. 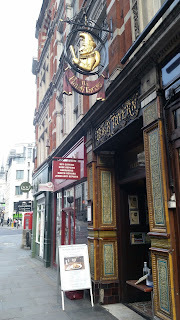 This time, RAS and TJP were hungry for the game pie and the fish pie - and with the standard set so high last time, will their dreams be shot down or will it be 'squids in' at the Punch Tavern? First up, the fish pie. According to the menu, this pie contains smoked haddock, king prawn, salmon, squid, mussels and mushroom sauce. 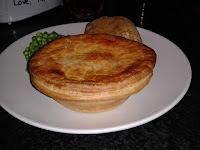 It costs £12.50, a price we decided last time wasn't "the cheapest pub pies out there, but by no means the most expensive...we would rate the pie pretty well for cheapness". We'd stand by that statement for this review - the Punch Tavern is in a great location and the pies come with a generous portion of mash and vegetables. For colour, the pie loses a few points because it looks a bit too dark - is the lid over-baked? The condition of the pie loses a few marks because - although you can't quite see in the photo here - the base of the pie has become a bit soggy in the sauce and has lost some of its structural integrity. Otherwise the pie looks well presented. 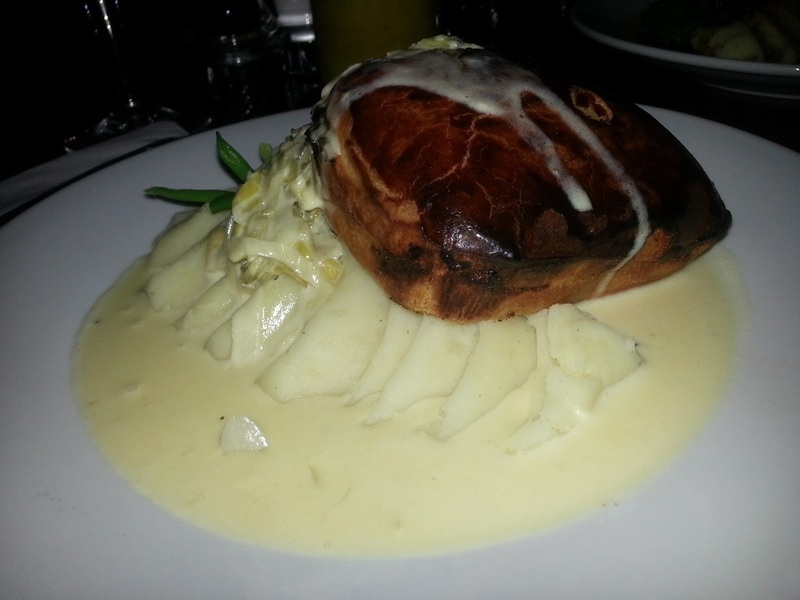 The pie truly is the king upon the castle of mash, surrounded by a moat of creamy sauce. On the cross-sectional view, you can see the content spilling out of the pie. The air gap you can see is just because the content has tumbled out of the pie. I'd say this pie was very well filled with a minimal air gap. The lid does look a little overly crisp - I'm hoping this isn't a sign of bad things to come. On tasting the lid, my fears were realised. Yes, the lid was rather overbaked for my liking - a bit too dry and crispy. By contrast, the base was a little too wet and soggy (after absorbing the moisture from the sauce). However, the pastry did still taste nice, and the filling was also delicious, although a little dry in parts - perhaps as the creamy sauce was mainly outside, rather than inside, the pie! I don't think I've ever seen such a wide variety of fish inside a pastry-encased pie before. The fish flavours worked well together with the creamy sauce (though you'll know at Pierate that we prefer our gravy in the pie, rather than round the side of it, so this is perhaps something to consider). RAS also felt that the fish pie was a little bit dry inside and overly cooked on top - so certainly benefited from the sauce surrounding the pie plus a bit chewy in content at times, but such a fantastic array of sea food and fully encased in pastry too that it was very impressive. 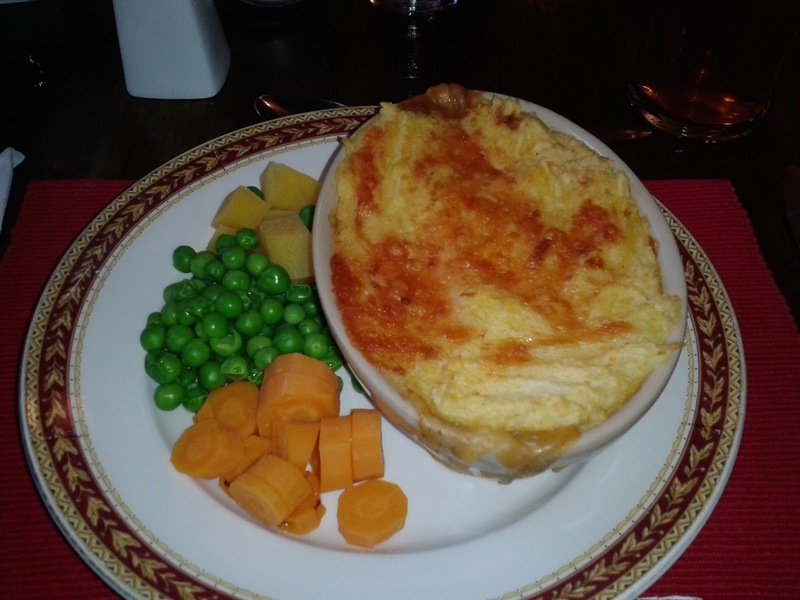 Overall, the fish pie was a tasty delight and I'd definitely recommend you give it a go! After all, you don't see too many fully-encased in pastry fish pies out there! 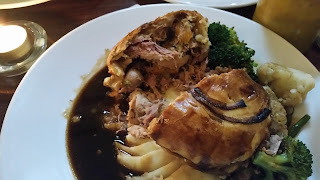 You'll see this pie appearing in the 'Best Pies in London Restaurants' article soon! Then it was time for the game pie. We both agreed that the game pie was the nicer of the two. 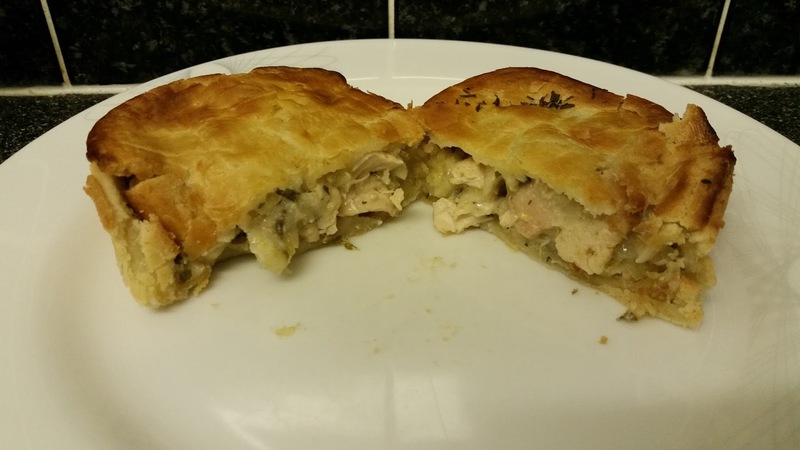 It was similar in quality to the rabbit pie eaten previously but a bit more of a mix of flavour. 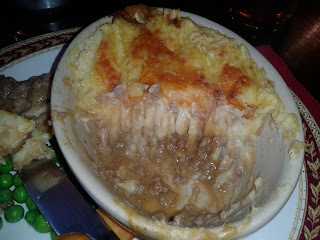 The lid wasn't quite as over-baked as in the fish pie, and it was stuffed with the same great quantity of content. With a similar price and similar sides of mash and veg, this pie had few differences to the fish pie we'd just enjoyed. 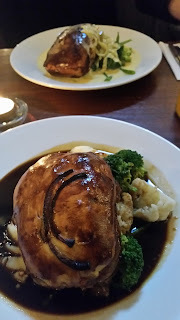 Overall they were both very good pies again and - while we'd would prefer them not to be swimming in quite so much sauce/gravy when served (I would rather add this myself really, as both pies arrived to the table with soggy bottoms due to this approach), they were two more top rated pies! continue reading "Pleased as punch with Punch Tavern pies"
It was the second week of the Wimbledon tennis championships and while it’s still early in the morning, you can sense the hustle and bustle as fans of one of the most iconic sporting events in the world start to gather for a (potentially rain interrupted) day of quality tennis. 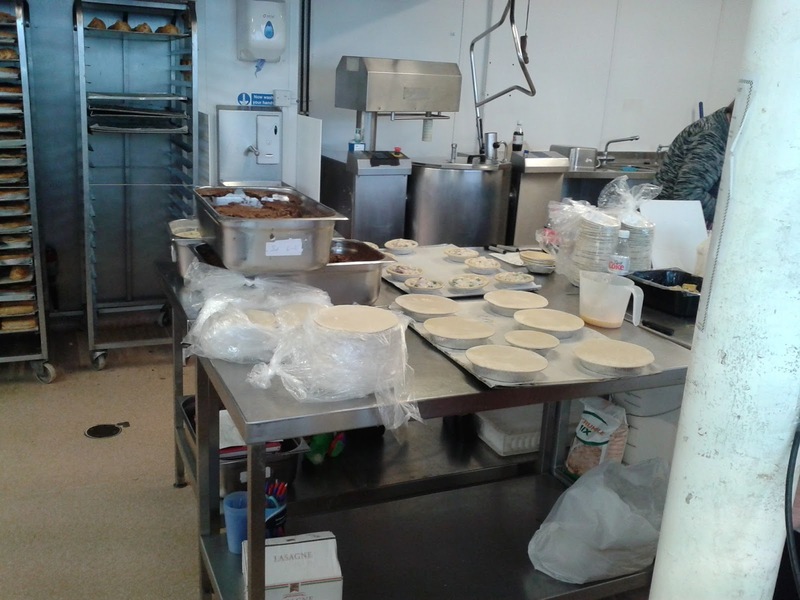 With a background as a chef, company owner Dee has been running the pie business as a full on business for the last 18 months or so. With the demand growing and growing (his pies have recently been in the newspapers for being well received by none-other than self-confessed pie fan and Top Gear presenter Chris Evans! 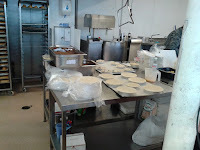 ), Dee finds himself in the kitchen nearly every day, with deliveries around London every few days. It was therefore great to get a good half hour chat in with the man himself! 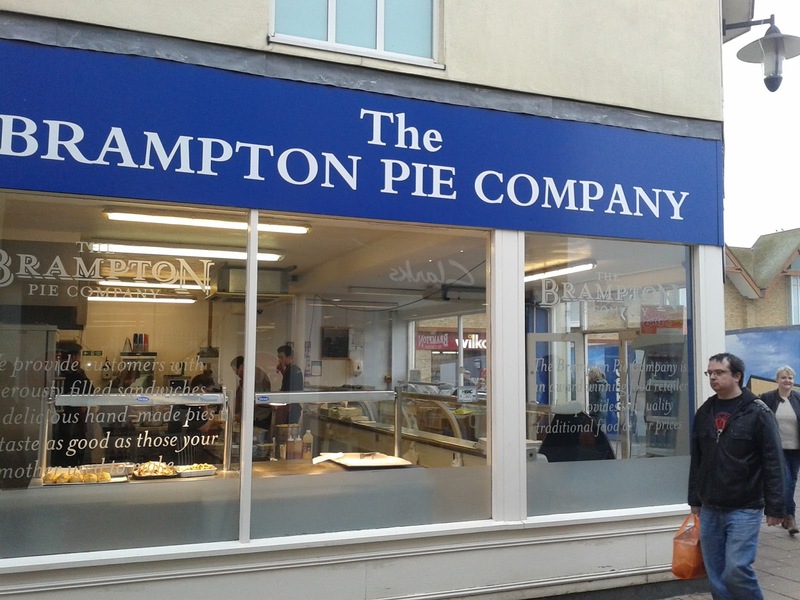 And a real pleasure it was to, talking pie and… well, more pie! This will form the basis of a future article, but for now, let’s get on with some pie rating! See below which pies are! To start off with, these pies have some of the nicest pastry around! It was great shortcrust pastry! A really good sign of a quality pie is that you can even enjoy the pastry on its own – and you definitely could with these Dee’s pies! The pie-fectionist in me would say the pastry did crumble slightly too easily in parts (especially the one we rated from frozen – but that was to be expected) but all in all it was delicious pastry and complimented the fillings well. You’ll also be pleased to know the pies all passed the “hand-held” test, impressive with the amount of filling packed inside! The only other thing to briefly mention about the pastry was that the colour – while far from being pale and anaemic like some pies I’ve rated – isn’t quite as golden coloured as I would demand for the perfect pie. Still, colour doesn’t affect the taste, so it certainly shouldn’t put you off purchasing! 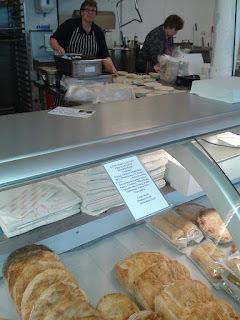 Dees Pies have gone for the one-price-fits-all policy of £3.50 per meat pie (with vegetarian pies all being just £3). It certainly makes it easier at the market stall, though I imagine it would leave some customers thinking they are getting a better deal if they go for a lamb pie over a chicken pie, for example. All the meat pies I had were definitely packed with a lot of meat and there was pretty much no air gaps to be seen, which is great. I’d say they are a tad small compared to what I would prefer – so while one was filling I would (in part because they are so tasty!) normally prefer one and a half to two pies. This does slightly impinge on their “cheapness” score but I would still definitely buy more! They certainly are very good pies and they have a great range of pies too, so with these being the general thoughts, let’s get some individual detail! Champagne chicken – This was a very nice chicken pie, filled to near capacity with lovely tender pieces of chicken (see photo above). While the sauce did add something to the chicken, I have preferred some other white sauces more. But the fact it is champagne will add sparkle to your dinner table and conversations if you serve it at a dinner party! A little something to compliment the chicken pieces would probably add to this pie, perhaps a little bit of carrot or similar, even though I would recommend focusing on the chicken element. A little small for £3.50 but generally very good and would eat again. English Breakfast – The breakfast pie contained a great range of ingredients, including quite a bit of meat and egg, though the pie did taste a bit sweet – I presume as a result of the inclusion of baked beans, which are known to contain sugar. Personally I’m not a fan of baked beans anyway, but the sweetness of them had infiltrated the whole of the pie, so pie fans should be aware of this ingredient before purchasing. However capacity was very strong and it is a great idea to put a full English breakfast into pastry as a breakfast option! Mushroom and Asparagus (v) – While the pastry was good as in all the pies and the capacity was strong, this combo didn’t really excite me. I am by admission a meat lover but the combo of quite chewy mushroom and crisp asparagus – while pleasant – did not really wow me. Certainly not a bad pie but I wouldn’t personally want to pay £3 for that veggie combo again. However I realise vegetarians may love this unique combo, which I don’t think I have ever heard of before! 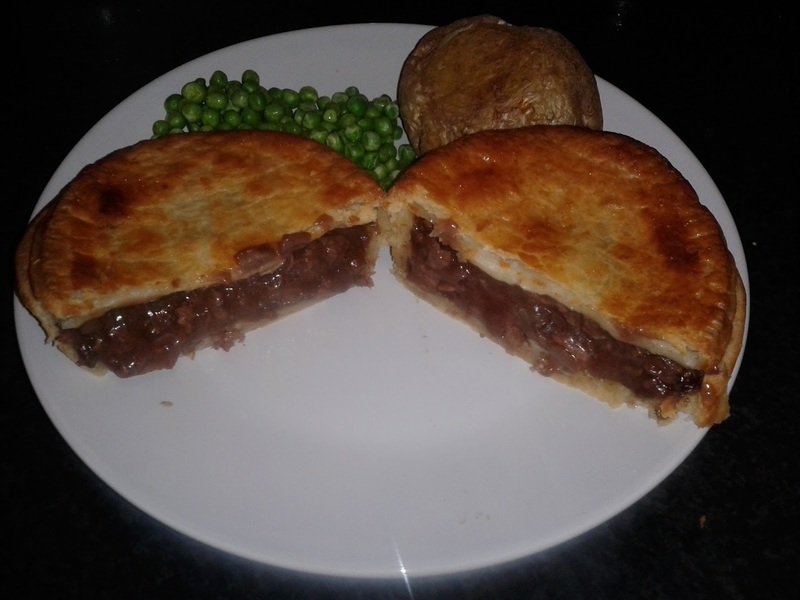 Overall, these really are quality pies from Dee’s Pies, made from great quality, fresh ingredients and I can certainly see why they have celebrity appeal! Two Pierate Highly Recommended offerings without even a steak and ale pie in sight! We’ll be rating two more Dee’s Pies soon, including my favourite one of the lot! continue reading "Are these Dees Pies Dee-licious?!" continue reading "My Eyes Can't Believe My Pies!" I don’t quite understand supermarket deli counters. Don’t they sell pretty much the same kind of stuff that you can get in the rest of the supermarket except you can get someone to hand it to you? Does cutting the cheese off a bigger block make it fresher than the stuff you get already cut? But the main problem I have is that I don’t feel I can just look at the counter to see if there is anything I might fancy because then the person at the counter will ask me if I want something. I will then panic and feel I have to ask for something. This normally means I end up with something weird that I don’t want like a piece of dandelion meringue. But, this is probably just my inability to interact like a normal human being! The reason this does happen to me quite often is that I like to have a glance at the deli counter to see if there are any interesting pies on offer. 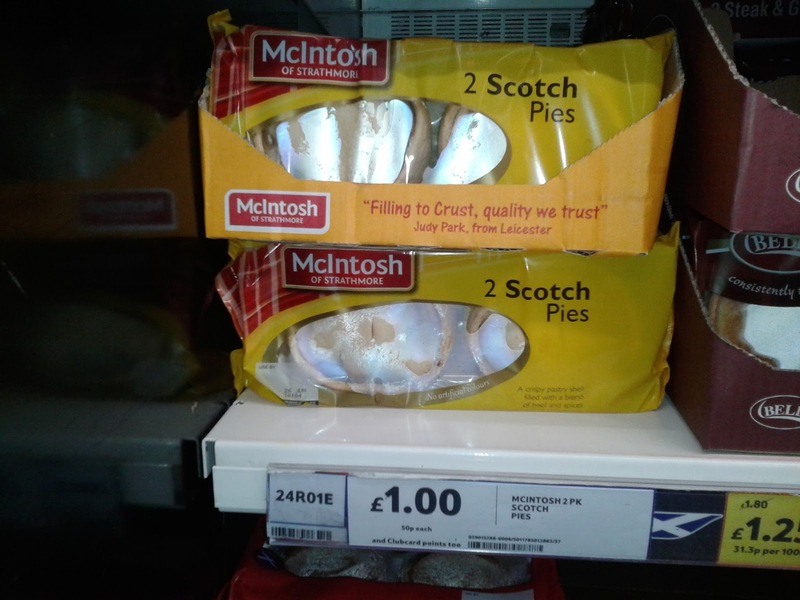 Whilst in Tesco I spotted a McIntyre Scotch Pie for 49p and thought I should give it a whirl. Given that the brand seems so popular I felt I had to review it as part of my quest to find out what makes the best Scotch pie. What slightly baffled me was that Tesco sell the packaged version of this pie on the shelves at 2 for £1. I was surprised that this 2p saving didn’t cause people to flock to the deli counter. For the very cheap price it wasn’t too bad, it beats other similar priced Scotch Pies in our rankings but don't expect anything amazing. 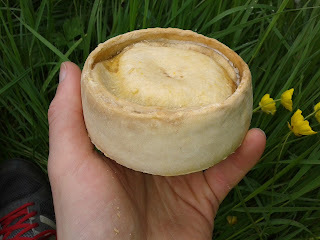 Condition - 4.00 out of 7 – Pretty standard Scotch Pie shape, it was more mass-produced in appearance than most. 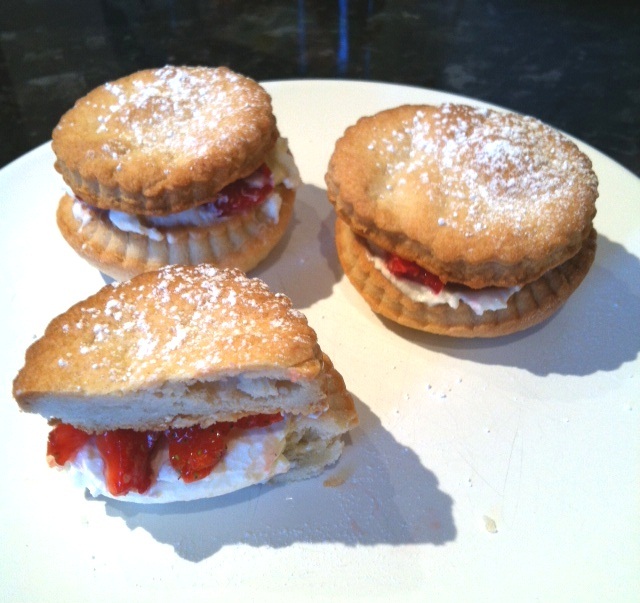 It did look pleasingly tall and didn't have an excessively large pastry rim at the top to hide lack of filling. Colour – 3.80 out of 7 – A little bit too pale but still appealing. 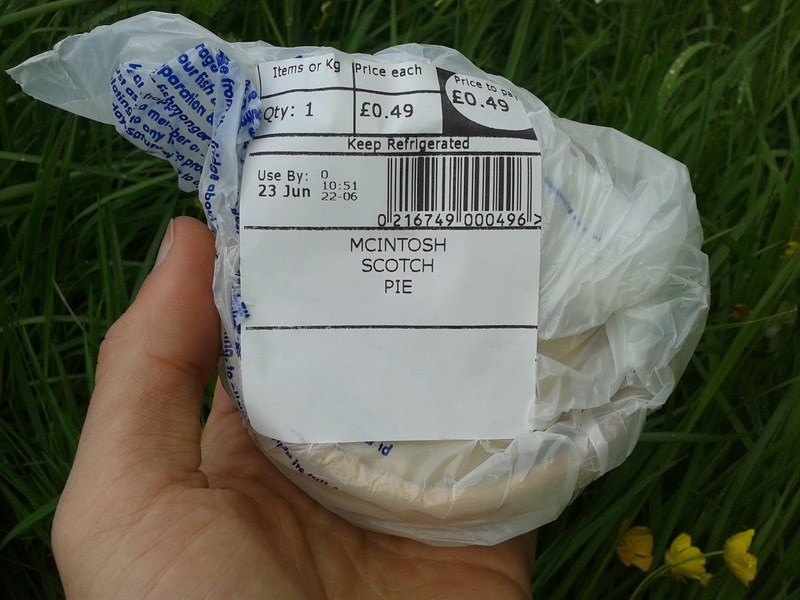 Cheapness – 6.00 out of 7 – Yes, Scotch pies tend to be cheap because they just contain mince and they are normally small. 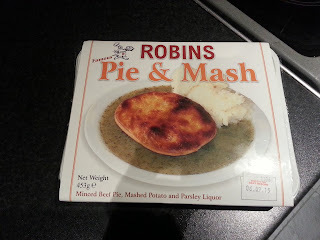 But 49p is a bit of a steal for any pie (as long as it’s edible). 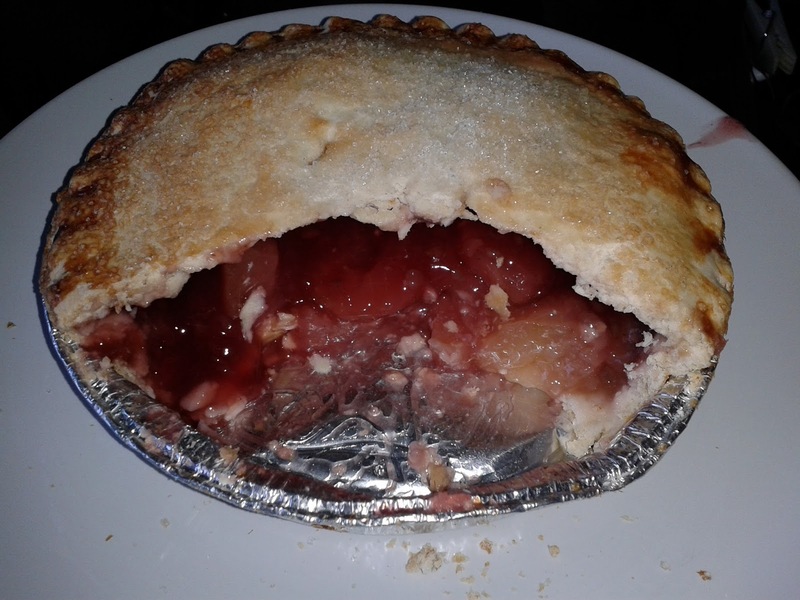 Capacity – 3.10 out of 7 – Like a reverse TARDIS, this pie seemed to look quite big on the outside but small on the inside. It wasn't all that well filled, this isn’t unexpected for a cheap pie but does bring the score down. 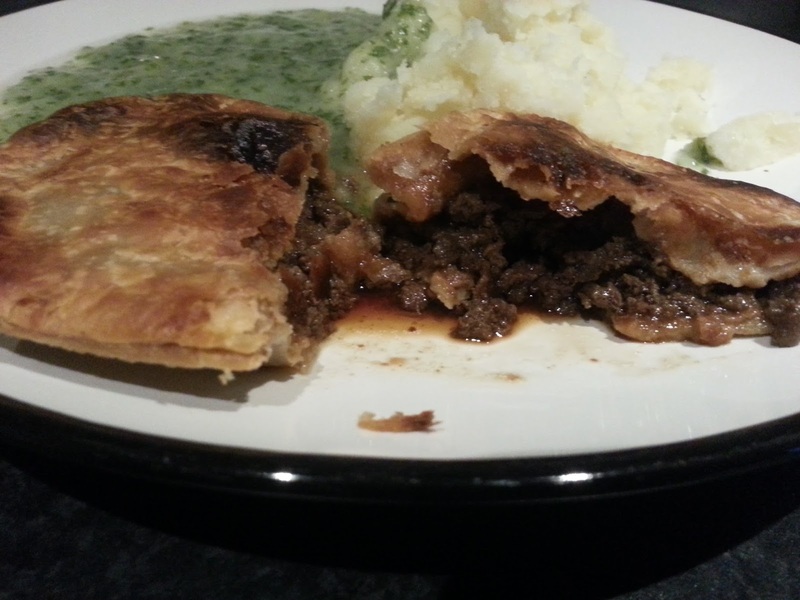 Chewiness – 3.90 out of 7 – The mince was ground up pretty fine so it wasn’t at all chewy. However, there wasn’t really any crunch to the pastry and there could have been a bit more to get your teeth into in general. 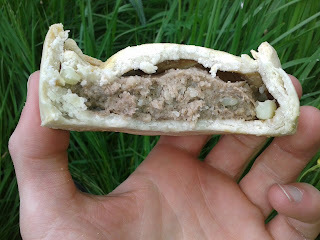 Content – 4.00 out of 7 – Peppery and moist, the filling was nice but for me it did taste a bit too much like a sausage roll. 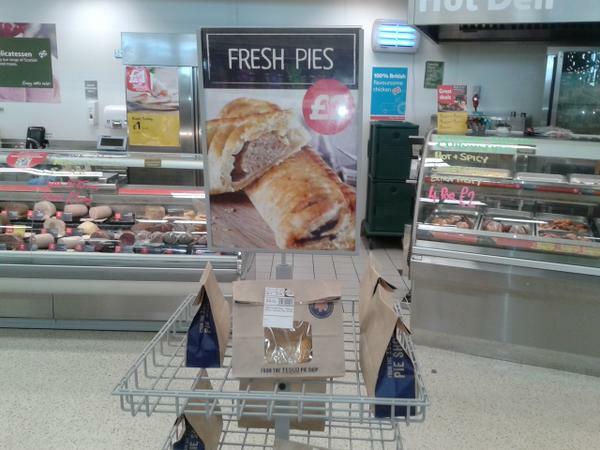 Perhaps this could be why Tesco Dumfries cannot tell the difference between a pie and a sausage roll. The fat kept it moist but they could have probably got away with less of it. It looked a bit rank. Consistency – 3.90 out of 7 – For the price this was not bad, it slipped down well. I think it is better than the Bell’s version who I guess are McIntosh’s main supermarket competitor. 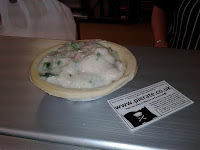 continue reading "A Load of McIntosh"
continue reading "The Brampton Pie Company Pie Reviews"
Why not serve up one of these beauties? Just make sure you don't drop (shot) these! 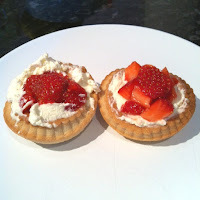 My fellow Pierateers have been their usual busy selves on Twitter during Wimbledon, and, not content with the pastryless Wimbledon classic that is strawberries and cream, they asked whether anyone had found any strawberry and cream pies. I'm not sure whether anyone actually did find any, but it was such a great idea that I had to make some myself! I searched online for strawberry and cream pie recipes and there were lots of versions, but most of them looked more like cheesecakes than pies. So I decided to just go ahead and make my own! Will they be a winner with you? 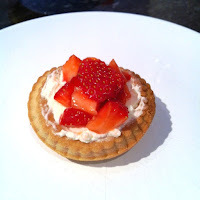 The recipe is very simple - shortcrust pastry cases and lids (make these separately and let them cool down before putting the cream anywhere near them because otherwise you'll end up with a melty disaster!) 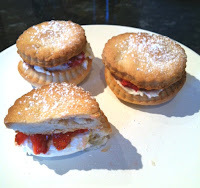 Then whip some double cream and dice some strawberries and assemble your pies! Strawberries and cream are, obviously, delicious. 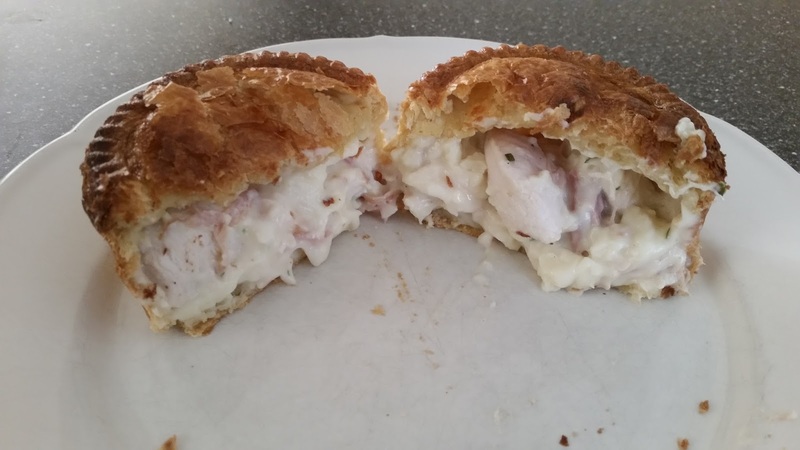 It turns out that they are just as delicious in a pie - possibly even more delicious because the crispy pastry works really well with them AND it saves you trying to balance bowls or plates while shouting at the tennis! 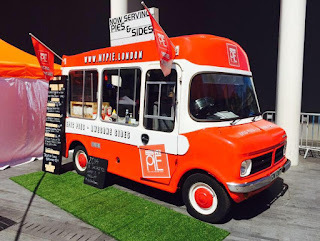 continue reading "Anyone for tennis... pie? Strawberries and Cream Pie Review"
Whilst the name might sound appealing, sadly this dish is not actually a pie. It is basically a Shepherds pie (or Shepherds potato bake as we would have it be called) but with the plain mash replaced with Rumbledethumps. Rumbledethumps is a dish from the Scottish Borders which combines fried cabbage and onion with mash potato. Whilst tasty it is certainly NOT A PIE. You have been warned. 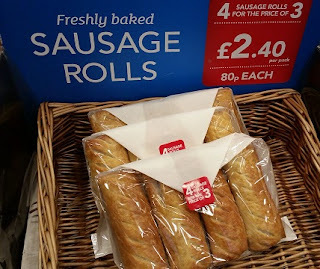 Unfortunately it appears Tesco are mis-labelling their sausage rolls as pies in their Dumfries store. It is not simply a case of accidentally putting a packet of sausage rolls on the pie stand - which we realise a customer (rather than staff) could have done. I have to admit it takes a lot to shock us aboard the Pierate Ship these days. Pies - our passion and dedication for over five and a half years now - have a tough press. People often mis-label many things as pies - the shepherds pie (which should be a shepherds potato bake), pumpkin pie (which is really a tart), even whole pizzas are called pies in America! And yet in all my days of pie rating for the web's leading pie reviewing website (www.pierate.co.uk) - which it might be worth pointing out is the number one hit when you Google "Tesco pie review" - and in fact in the 20+ years beforehand growing up, I have NEVER... EVER... seen a sausage roll called a pie before! May I just take this opportunity to remind you that we run www.pierate.co.uk and not "ratemyroll" or any such thing. We have a readership of over 10,000 readers a month at present and they want to read our PIE reviews, not sausage roll reviews. Similarly, when they shop in a Tesco store, if they want to buy a pie, they want a pie - not a sausage roll. I'm sure this error will be rectified immediately at the Dumfries Tesco store at which the error was made - and will also be checked at other Tesco stores nationwide to ensure that the same error has not been replicated across the country. Sure, to many of your customers the mis-labelling of a sausage roll as a pie won't be even generate the batting of an eyelid. And for sure it did not ruin our holiday to Scotland last week - just taint it with confusion and bafflement. But I am sure you will understand that we want to promote pies as much as we can and a sausage roll is NOT a pie! Let's face it - it's not called a "Sausage Pie", is it!!! To help you out here, our Pierate Pie Dictionary clearly states what a true pie actually is:- filling fully encased in pastry with clearly defined base, sides and lid. A sausage roll does not meet these stringent criteria and never in all my days have I heard someone refer to a sausage roll as a pie before. Of course you are probably aware of our campaign to change pie pub provision, but the selling of top-crust pies has been significantly trumped by this outrageous claim that a sausage roll is a pie! Even the British Pie Awards - who have a far more liberal definition of a pie than us (they have a pasty category, for example) would not consider a sausage roll to be a pie! As I bring this letter to a conclusion, I hope this has been useful to explain the issues surrounding the mis-labelling of food (we only need to mention "Horsemeat" to kick that off again) and will lead to a correction in your store's advertising. I am happy to speak to you further if you wish to - just email pierateship@yahoo.co.uk to arrange this. 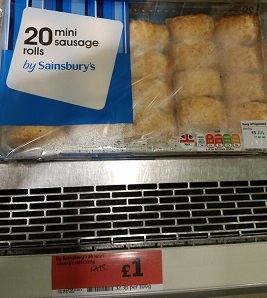 I am pleased to say that following this incident in Tesco Dumfries we can confirm that both Sainsburys and Greggs do know what a sausage roll looks like and label them correctly. We hope that Tesco might be able to send us a photo of the new pie poster when it takes "pie-de" of place in their pie aisle, and we've sent them a request to do so. We will update you with any news! 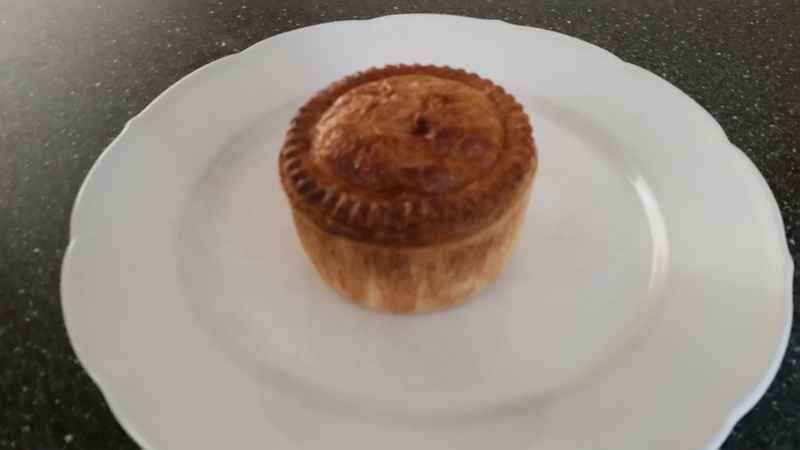 We have actually eaten a lot of genuine pies (not sausage rolls) which can be seen in our Pierate Pie Rankings or you can click here for all PIE reviews categorised by shop or flavour. Where do you stand on the pie v sausage roll debate? 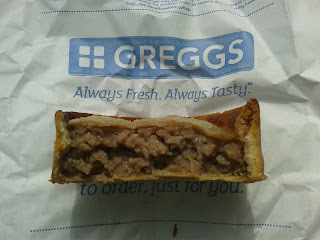 continue reading "Open Letter to Tesco - Sausage Rolls are NOT pies"
Given the recent campaign to save the macaroni pie from being dropped from the Greggs line up I thought it was about time for a Greggs pie review. 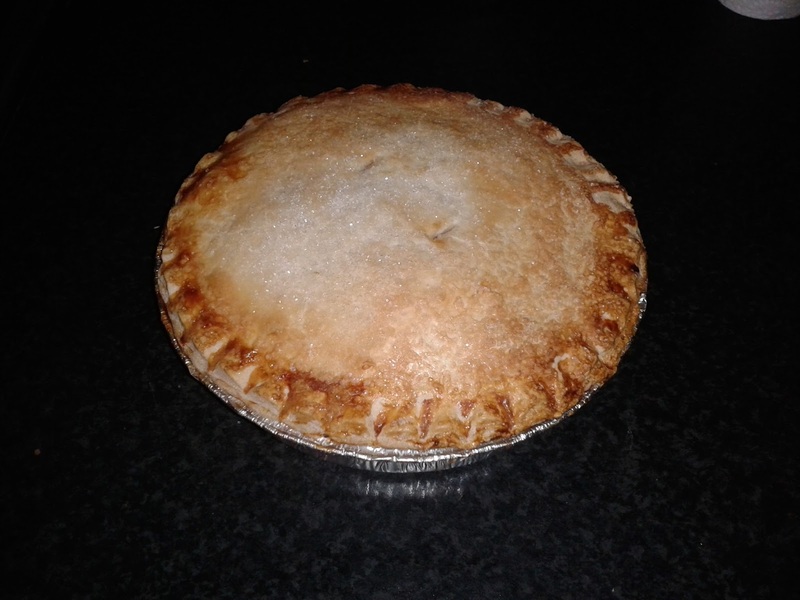 As Pierateer RAS has suggested, is it even worth saving their pies when they are not know for being the best quality? For the biggest bakery chain in the country Greggs have a pretty poor line up. In many stores you won't find any pies, just pasties and slices. In Northern England there are meat and potato pies available and in Scotland you can find Scotch Pies. 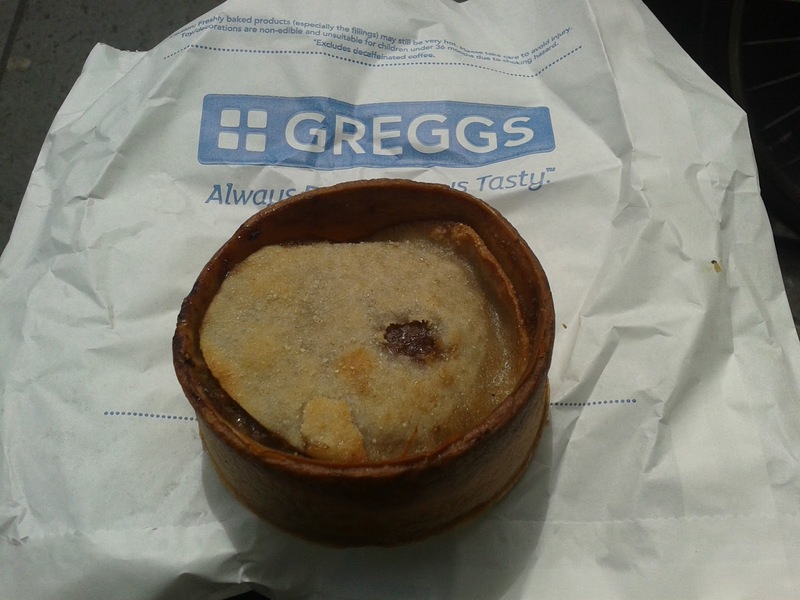 I am not sure if it is just me but I have often found a lack of Scotch Pies in Greggs Scottish stores. Perhaps they just sell out before I get there. When I have seen them I have avoided them because to be honest I expected them to be pretty ropey. They look quite dried out and my previous experience with Greggs frozen pies put me right off. But on a recent sunny afternoon in Glasgow the time seemed right to grab a Greggs to review after finding a few left over after lunch time in the Trongate store. How will they compare against the other Scotch pies we have rated? Condition - 2.50 out of 7 - I thought this pie looked pretty terrible, the rim and pastry sides looked dried out. It had a wonky appearance as if it had been made by a child. 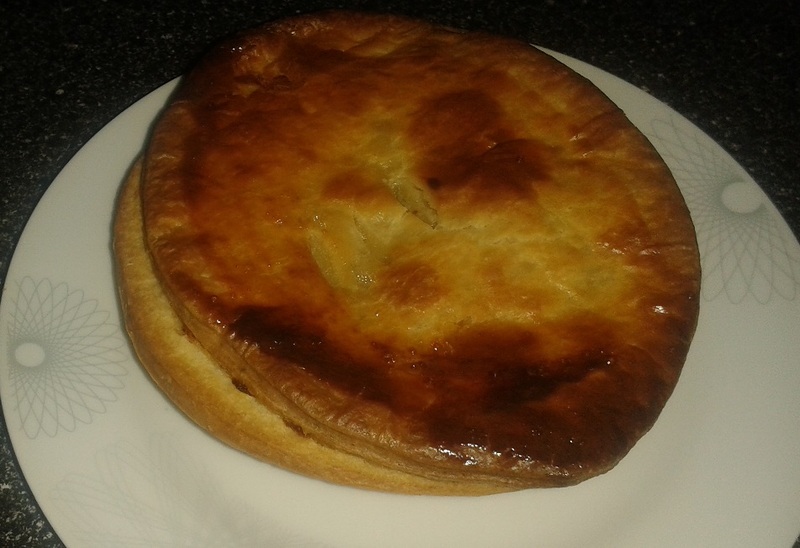 Colour - 3.00 out of 7 - This pie had browned up too much in places but in others it was pale and pasty looking. Cheapness - 5.00 out of 7 - At just £1 this is cheap compared to most hot pies however Scotch Pies are normally cheap. Their small size and fatty meat makes them cheaper to make than other pies. Capacity - 4.25 out of 7 - Whilst the capacity was limited by the small size of the pie I could not deny it was almost completely filled. Chewiness - 3.25 out of 7 - The burnt pastry sides and rim were every bit as bad as they looked. They were so dry it was almost impossible to actually take a bite. It was like this pie didn't want to be eaten. Somehow the rest of the pie was really soggy. The filling wasn't at all chewy as it was ground up so fine. Content - 4.25 out of 7 - I wanted to hate this pie as I sometime perceive Gregg's as driving out smaller bakeries and robbing us of choice (and pies). 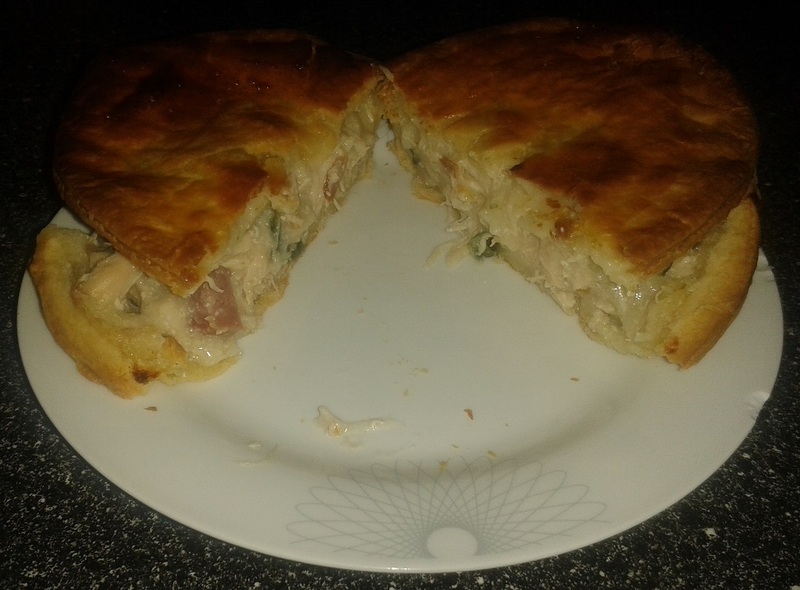 However, there wasn't too much to criticise in the taste of this pie. It was perhaps too generic and a little salty but it was a typical beef Scotch pie flavour which I enjoy. It was clearly low quality meat as can be seen in the close up pictures, some of it looks pretty disgusting and you wonder what it is actually made of. Consistency - 3.50 out of 7 - The trouble with many Gregg's products is that they aren't consistent. If you get one which has been sitting in the hot counter for a while it can be dried to a crisp. 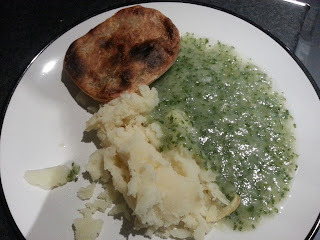 On this occasion the texture really let this pie down and whilst it wasn't bad I don't feel it is one I could recommend. It is interesting that Time Out Edinburgh recently ranked all Greggs baked products and the Scotch pie was recently ranked second from bottom. This is perhaps not surprising when Gregg's seem to inexplicably neglect our favourite pastry product. 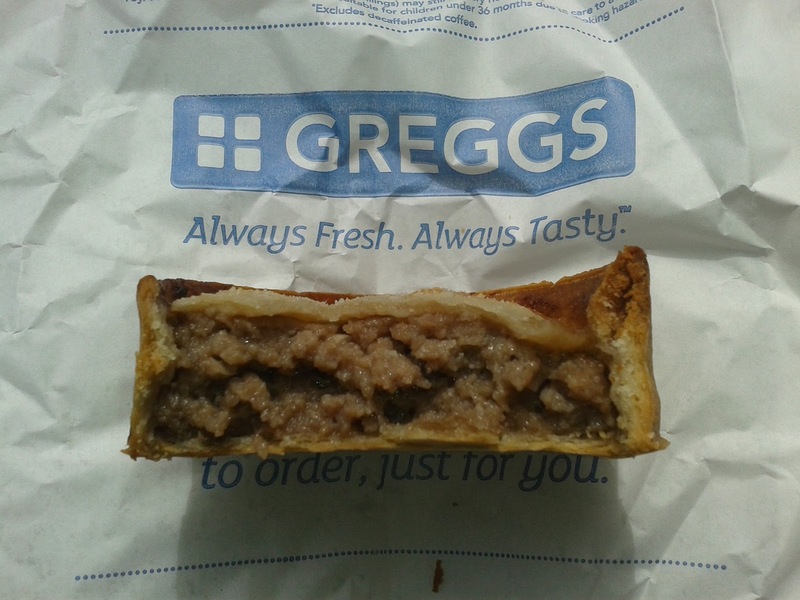 Pie fans be rest assured, we will continue to give Greggs abuse about this as much as we can. 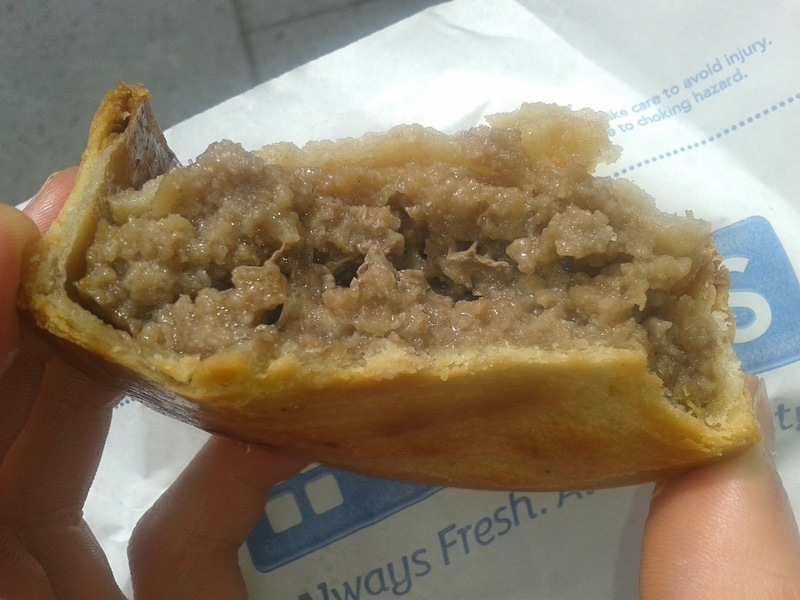 Update: I contacted Greggs to double check the pie was beef but apparently it is 17% beef and 2% mutton as well as containing Pork lard! The list of spices included is quite impressive, see the ingredients list below. Thank you to Greggs for supplying this information.